I'll never forget the sensation I had at the unveiling of Gottfried Helnwein's "Kindskopf" in the Russian Museum. And not just because this enormous canvas (six metres in height, four in breadth), well-known from reproductions, seemed to operate in a whole new way in the real, quasi-monumental space of the museum's "Concrete Hall", originally intended for the demonstration of gigantic sculptural compositions. I realised that I was looking at the inner content of this innovative picture from a whole new point of view. For it turned out that the young girl's somnambulistic self-immersion, taken to represent estrangement and reticence in reproductions, had an almost physical quality of impact. One that turned the sensory strength of perception up to full pitch. Introvert became extrovert - or rather, co-existing with the extrovert in a certain twilight zone, into which the viewer's perception is sucked. This new level of impact was also apparent on the pictorial-plastic level. What had seemed coldly technological, the aesthetics of hyperrealism, a mechanical aerographically-applied surface, proved to be living and breathing; a completely handcrafted pictorial texture. In short, a work seen in the flesh at the right time and in the right place ("Kindskopf" was both created and first exhibited in an equally monumental church-like space - in the medieval Minoritenkirche Krems), providing an instructive example of Helnwein's deliberate strategy of interaction with the viewer. Yet there was more to it than that. After all, modern art quite often offers an insight into the positive and negative manipulation of viewer perception. In the case of the Russian Museum's exhibition of "Kindskopf", however, it was circumstances that divulged (and I am sure not just for me) the direction of Helnwein's strategy. Parallel to Helnwein's one-picture exhibition, the exposition "We Worship Thy Immaculate Image", displaying iconographic images of the Mother of God, had just opened in the Russian Museum. Moreover, in direct physical proximity. Two apparently diametrically opposite phenomena - Old Russian religious art and Helnwein, enfant terrible of modern Western culture! Nevertheless, the paradox of this completely impromptu clash of polar art forms revealed certain aspects lying at the heart of the "Helnwein strategy". The neighbouring halls were hung with icons, images which effect a special kind of interaction with the auditorium, one step beyond the purely aesthetical. People traditionally turned to the icon in search of intercession and defence, comfort and miracles. This interaction presupposed a response movement from the icon, a movement both spiritual and humanitarian, a "softening of evil hearts" (which was, incidentally, the name of one of the icons of the Mother of God). The atmosphere of these halls provided a whole new insight into Helnwein's mission. Into his idealistic if antiquated, naive, almost diffident, revealed, imperative humanist pathos! The entire strategy of interaction with the viewer is based on expectation of an effective response reaction to matters of the higher ontological meaning of life. A reaction no doubt alien to post-modernist discourse, with its concentration on itself and questions of language. But of the utmost importance if what we are talking about is the outmoded yet eternal theme of the positive and ethical role of art. And judging by just how naturally the reflected light of the "Mother of God of the Softening of Evil Hearts" falls on "Kindskopf", that is precisely what we are talking about. The humanist subtext in Helnwein's art, ringing out loud in "Kindskopf", did not of course appear overnight. It gathered momentum over the years, with experience. The young artist, quickly winning fame in the 1970s, concentrated on the question of the impact of art as such and its possibilities for reaching, touching and hooking the viewer. He would later say, "I would be very upset if my pictures could only reach several hundred people, and not millions, as it is with any professional skier or footballer." The seventies were thus spent in search of the means of "capturing" the viewer and ways of activating his own creative programme. This can be regarded as happening on two levels. On the first level we have Helnwein the action artist, director of scandalous, socially-directed actions. Here he worked directly inside the public body, as it were. However, as was often the case with Joseph Beuys, the impact of these actions was mostly confined to young radical art groups. Which was neither the impact nor the reaction that Helnwein had in mind. His response was to turn to the sources of mass culture, its idols, and the mass media. And on this level Helnwein soon found the degree of efficacy that he was seeking. Helnwein's cover portraits for leading popular magazines did more than just help him to "wake up famous", Byron-fashion. They introduced Helnwein to the elite, to the cult figures of pop culture: rock idols, film stars and politicians, as well as avant-garde artists, those who nailed their colours to the flag of "high" in the eternal opposition of high and low culture. This interest in cult figures was never to desert him, though with time would be directed elsewhere: at the very mechanism of mass publicity - what makes certain figures so charismatic, identifiable and revered? Or, to be more exact, how do they live up to the expectations of the public? What is it that the popular viewer wants to see, identify and revere in them? This hijacking of the leading lights of "high" or avant-garde culture (Roy Lichtenstein, Andy Warhol, Francis Bacon) by popular culture was also the subject of his research. How does radical art, the property of the elite, evolve into a phenomenon of popular success? When Helnwein entered popular culture, pop art had already been canonised. Elements of reflection from it are therefore perhaps inevitable in his art. Helnwein, however, set his own pace in the context of popular culture. Whereas the classical pop artists pragmatically appropriated the language of the mass media to their own creative ends (which were often quite complicated and personalised), Helnwein's aims would appear to be simpler and more directed. In his portraits he seems to specifically pick out the substance of success, of mass popularity and cult status. Unlike the pop artists, he does not appropriate so much the mechanism of popular culture as a medium, instead, he makes the very essence of success his medium and, in doing so, he confesses its spell over him. One way or another, by the end of the 1970s Helnwein had unravelled the mechanics of publicity and the selling of the legend to the public. Yet if in his portrait works we are sucked into the legend, into a myth, then in his works of another type the mechanics of impact and "capture" of the public are directed elsewhere. Enter the theme of being sucked into horror and the aesthetics of psychological terror. This is the starting point of the artist's long series on the theme of the unrelenting daily attack on personality and the transformation of violence into an image and style of life. Much ink has been spilt on the more shocking of Helnwein's series. Just as the artist himself set down his idée fixe with cold scientific precision, so too did the critics compose a lexicon of "Helnwein passions". The cynical smile of the mad surgeon in the operating theatre; the helpless corpse of a car-crash victim; the loneliness of a woman changing her clothes at the back of an office; the weary bureaucrat clutching a folder; a psychopath wielding a knife . . . Deformity is shown at point-blank range, devoid of aestheticisation. No baroque-like excesses of a Witkin or Greenway here! Helnwein's chilling, fixating intonations are deadly effective. It was at this time that Helnwein acquired his command of the means of expression. A traditional German Expressionist energy gathered in his pastels. In painting he showed he could transfer from minimalist colouristic compositions to condensed and suggestive imagery reminiscent of Francis Bacon. In his graphic works, alongside his predilection for the aesthetics of comic books, there resounds a mighty note of symbolism, sometimes orchestrated by the over-refined graphicism of the Vienna school of Fantastic Realism. Yet these are but flavourings and seasonings which the artist adds to his cuisine as required. What constitutes the meat of Helnwein's cuisine, however, is a merciless, documentative realism. Intensified optics of form, photo-orientated and utilising to the full the archaic magic of the freeze-frame as spotted by Susan Sontag. The extra-emotional sterility of the artist's method (at times spiced by the aforementioned devices, particularly in his diptychs and triptychs) is effective a priori. It is like a documental cadre, or a diagnosis, or the results of a controlled scientific experiment. But then, especially in our day and age, documents, diagnoses and lab results can be challenged. Or overlooked. Modern culture has learned to pass them by. In order to be heard, what is needed is the artist's hidden fury, the energy of protest, overcoming hopelessness to give hope. Which is just what Helnwein has. Not for nothing has he been called a shocker artist with a soft centre. The critics immediately set about musing over the forces that call the "Helnwein passion" to life. Helnwein does indeed resort to truly drastic measures. This is well illustrated in his numerous sets of photographic and pictorial self-portraits, in which he squeezes and deforms his own face with various bandages, compresses and surgical instruments. Helnwein avoids elements of autobiography - even though his face is already a trademark of sorts. It presents us not with personal, but with universal abuse of the human being; with a visual lexicon of the all-out attack on personal freedom. Among other extreme measures employed are the clichés of Nazi subculture - its iconography, ritualist hand signals and uniform - which have equally unpleasant connotations for the modern viewer. The incisive instruments in Helnwein's self-portraits are polysemantic. Some see analogies with the eighteenth century sculptures of Franz Xaver Messerschmidt. I myself am reminded of the drawings by Nicole Henri Jacobe in Bourgeoirie's "Traité complet d'anatomie de l'homme" and of other associations closer to modern man, unacquainted with the very specific genre of anatomical studies yet well acquainted with twentieth century history: the instruments for measuring skulls used by the Nazis to sift non-Aryans from Aryans. Why does Helnwein employ such ponderous and shocking images? Not of course for effect as such. Nor to demonstrate his power over the viewer's perception. Neither is it the "slap in the face of public taste" so beloved of the Russian Futurists (which in today's world would be taken as a protest against both conservatism and PC - political correctness, which has become a brand of liberal terror). No, the measures employed are far too extreme for this. The "Helnwein passions" clearly have constructive, not deconstructive ends. This is no abstract existentialist angst. It is not exposure of the sores of society, nor is it battle with their physical manifestations (as in Hans Haacke and Barbara Kruger's political conceptualism). Helnwein works with perception and behaviour, activising them both to the full. His aim is to lift the blockade on modern consciousness, a consciousness grown sleepy and inert, dulling natural reactions to the challenge of the times. Helnwein's intended results are impact and reaction. The artist's position is particularly clearly crystallised in his various works devoted to children. The images of children are the weirdest and most shocking exponents in the "twisted herbarium" that the artist began to assemble back in the 1970s. His drawings are paradoxical dissections of the aesthetics of comic books; they present children as the objects of manipulation and physical and psychological violence. Yet they are also the catalysts of this violence. Their figures are crumpled and disembowelled, like rag dolls. Nevertheless, like real dolls, they continue to entertain, extending an invitation to play, just as the ambiguously smiling children of Helnwein's early drawings continue to provoke aggressive adult reactions. Similar discrepant functions are also present in Helnwein's photo-works on the child theme. Since the end of the nineteenth century, photo-images of children (including photo-based art) have generally carried the paradoxical stamp of eroticism, as if sublimating the problems of sexuality and perversion afflicting society. This line is wholly distinct in photographic art, stretching from the early photographs of Lewis Carroll, creator of Alice, to the modern works of Sally Mann. Helnwein is undoubtedly to a certain extent following this tradition. The subject of his child series is, however, not so much sexual trauma as childish trauma in general: the unchildlike load which has become the burden of child consciousness; the excessive, deforming weight which society has subconsciously placed on the shoulders of its children. It is believed that Helnwein sought his identity as an action artist in this child theme; an artist that both documents and provokes responses. And one of his most important works was indeed created in this genre, one that directly preceded the scale and conceptuality of "Kindskopf" - "Selection" (Neunter November Nacht), 1988. On 9 November 1938, the fiftieth anniversary of Kristallnacht, Helnwein erected a hundred-metre wall of photo-images of children, stretching from the Ludwig Museum to Cologne Cathedral, in memory of the millions destroyed by the Nazis. The use of space in "Selection" is very effective. It is not just the road that leads to the cathedral; it is the road along which prison trains may well have left for the camps. Executed in Scannachrome, the photo-images are neither staged nor stylised as an historical document. They are simply children, "captured" in various moods and states of mind. The mark of tragedy is "inside", nothing more than the deadly white bleaching of their faces. This could, however, be alternatively interpreted as maquillage, when children paint their faces on festive occasions. The burden of tragedy is "outside". It is in us, peering into the eyes of the children as we walk along the hundred-metre route. This work was the first time that Helnwein had so logically (totally, I would say) worked on the direct behavioural reaction of the public. He pre-programmes not only our perception, but our protest and repulsion too. Not long after "Selection" was unveiled, several photographs were set alight, ripped and slashed with a razor blade. These indications of violence remained as scars on the face of the image. 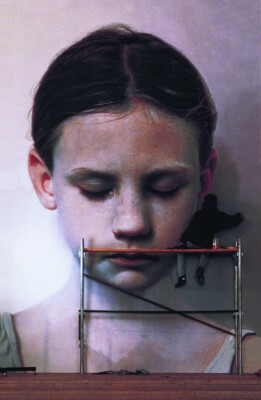 Helnwein continued to develop the child theme after his "Portrait of a Child". He brought it together with biblical motifs, like his "Madonna" exhibition at the Modernism Gallery in San Francisco. One of his most recent works - "Epiphany" (1996) - employs biblical reminiscences in a truly shocking modern context: young Aryans in SS uniforms closely examine the baby in Mary's arms. These hideous "Magi" seem to be concerned solely with the Messiah's social pedigree. This intrusion into canonic iconography could have veered towards blasphemy, were it not for the artist's clearly ethical approach and humanist priorities. I'll never forget the sensation I had at the unveiling of Gottfried Helnwein's "Kindskopf" in the Russian Museum: the almost religious response charging straight from the heart to the image of the child, with its adult burden on its tender shoulders. And I don't think I was the only one to feel the artist's humanist pathos and the reaction he was counting on - the urge to take on part of this burden and sense a taste of hope.